I’m so excited about stage productions. They reveal attitude, prejudice, motive, love, duplicity, passion, and perhaps even madness. And some have music! Who could ask for anything more? This historical “lesson” is true of the two most recent plays I’ve seen: Kathie Lee Gifford’s Saving Aimee and Peter Oswald’s translation and adaptation of Friedrich Schiller’s Mary Stuart. Although it isn’t a musical there is no lack of drama in the conflict between Mary Queen of Scots and Elizabeth I. The standoff resulted in Mary’s death while Aimee’s story, although the conflict had not ended in death, had a wildly intense and fascinating life. The prospect of having a history lesson taught in a lively, wildly musical and humorous way was the real draw for Saving Aimee. Kathie Lee Gifford has a keen eye for Aimee Semple McPherson’s life and turns it into musical gold. She co-wrote the book, the music and the lyrics. Gifford takes a look at the passionate preacher and slyly takes a poke at her piety, pompousness and sometimes, her grasping for power and privilege. David Armstrong, 5th Avenue’s Executive Producer and Artistic Producer, directs this production. The set is the same throughout the show. Dramatic white stairs curve up both sides of the white stage to a pulpit with the band sitting behind it. The band members are all dressed in rose red band uniforms that remind me of the ‘40s bellboys. Periwinkle and lavender lights bath the scene in glamorous purity and austerity. Each curving stairway has one landing about three or four steps up from the stage. These landings, as well as the automatically moving furniture in the center are the settings for all the scenes. They serve as the prosecutor’s table, witness chair, the radio studio that Aimee buys and other uses. The center below and between the stairs has a complicated origami-type, blue, camera-iris background that opens to show prairie halls, stage for preaching, a bordello, and the luridly presented bible stories dramatized in Aimee’s church. Aimee’s costumes after she goes on the road to preach are all elegantly-white dresses with an embroidered cross and dramatically long sleeves that drape like a wizard’s gown. When the show opens Aimee is a rebellious 17-year old, not above appealing to her father (Ed Dixon) to help her get around her mother. She wants to go dancing and to a school Shakespear production but isn't allowed to. She’s rails against her mother’s rigidity and flounces around, sulking about the limitations on her life. This is a reality that mothers of teenage girls recognize, then as well as now. I’ve seen it in my younger siblings, my daughter and my granddaughters, and even in my own saintly life. Teenagers seem to try on personality traits like costumes, changing to another one as soon as the first gets tiring. As teenagers, we all thought that we would never act like our parents; we’d have a different life with a lot more fun. We’d never be tied down to a dreary life, full of endless household chores and the insistent demands of numerous children. We wanted an exciting and stimulating life. We'd never make the foolish mistakes that we thought our parents did. We wanted to be responsible for own lives, mistakes and all. It's kick in the backside when you realize that the choices you made and the their consequences made us very much like our parents. At 17 Aimee’s ready to fall in “LOVE”, gushingly, wildly, passionately and ridiculously. She’s an impatient, impulsive young woman who is in love with romance, wanting to see the world and confusing a wildly romantic, Irish charmer with a passion for God as being completely different from her mother. In this encounter, she ironically becomes everything she wanted none of when she was on the farm. Aimee Elizabeth Kennedy was born in Ontario, Canada in 1890. Her stepmother Minnie (Judy Kaye) was raised as a rigid Salvationist and dedicated Aimee’s life to God’s work; and, as Aimee (Carolee Carmello) notes, Minnie dedicated Aimee’s life, not Minnie’s. Aimee rebels against the rigid code of behavior that her mother deems suitable for a child of God. She wants to go dancing and to plays; she wants an exciting social life beyond the small community she lives in. 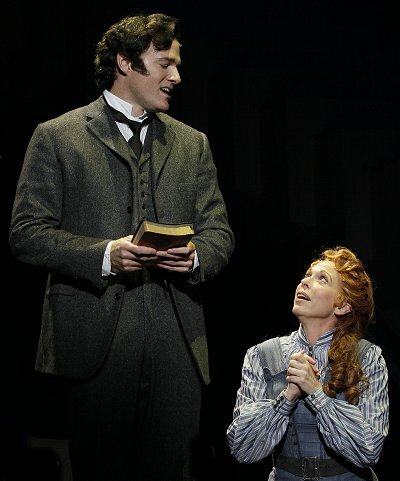 At 17, she attends a revival meeting and finds God, speaks in tongues, and perhaps most importantly, meets a handsome, young, Irish immigrant and preacher, Robert Semple (Ed Watts). They marry the next year and Robert encourages Aimee to preach as much as he does. Her passion for God and the fact that she was a woman made her real draw. Together they drew audiences from all around wherever they preached. I thought that it was remarkable that people would travel up to a hundred miles to attend a revival, especially with the limited transportation options. Then, I remembered stories my Mom told me about growing up in South Dakota's Black Hills. In the ‘30s and early ‘40s she, her sisters and friends would go 40 miles to a dance since nothing but homemade entertainment was readably available. Aimee and Robert went to Chicago to train as missionaries in foreign lands. They journeyed to China, via Ireland to visit Semple’s home, to London to preach in Albert Hall, and then through the Suez Canal to Hong Kong. They were only three months in Hong Kong learning the language when Robert died of malaria. A month later their daughter Roberta Star Semple was born. Still only 19, Aimee was a penniless widow with an infant child and no way to change her life. Minnie sent money so Bertie and her mother could come back to New York. Minnie had moved there when Aimee’s beloved father James (Ed Dixon) died, to work in a Salvation Army mission. There Aimee met and married businessman Harold McPherson (Brandon O’Neill) but a botched hysterectomy after the birth of her son Rolf Kennedy McPherson left her near death, weak and confused. She heard voices and decided that God was telling her to preach the gospel. When she recovered, she left her angry husband, took her two, very young children and her mother with her, and went on the road to preach across America and Canada. 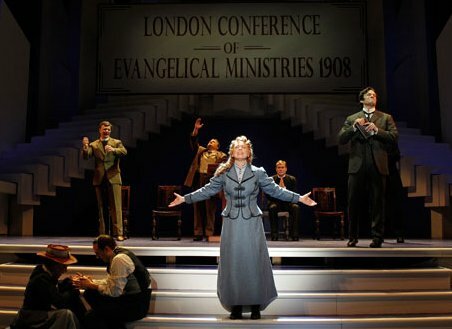 At that time, revival meetings were the equivalent of live theater for small farming communities. She preached at tent revivals, churches, community halls and any other venue where she deemed there were souls in need of her message. 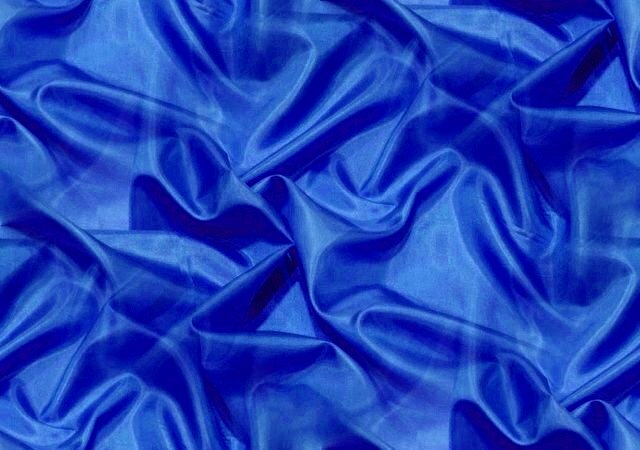 She did not discriminate against the degree of sin, going into saloons and places frequented by people of low repute whom she figured needed the message of God’s love and guidance. She “saved” a bordello madam Emma Jo (Roz Ryan) who subsequently traveled with the family and became a close confidant to Aimee. She reached a turning point in her ministry after she went into a movie house for the first time. Aimee was amazed at the impact the screen spectacle had on the audience. She decided that she’d learn the techniques and use stories to enrapture her audience. She wanted to use all the tools and technology available. She, her children and mother went to Hollywood to learn ways to attracted people so she could enhance her message. She also wanted to establish a permanent home for her children and church. Aimee founded the Foursquare Gospel Church which, according to the church’s website, now has two million members worldwide. 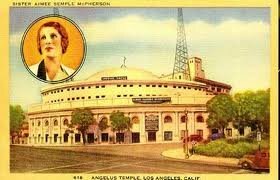 For $1.5 million, she built the Angeles Temple, a 5,000-seat, circular theater which was dedicated in 1923. Aimee was a pioneer, breaking barriers by becoming the first female Pentecostal evangelist and as such, the first to preach over the radio airwaves. She bought a radio station to preach to those who couldn’t get to the Angeles Temple. 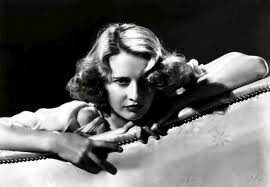 She was a celebrity and a darling of the press in Hollywood and around the world. She was courted and feted by political figures, movie stars, atheists and other churches. She was a forerunner of a rock star. My theater companion Alyce told me about her upbringing in Pennsylvania. Her father was a preacher in the Brethren denomination and she led a proscribed life. Her father and other preachers across the country were reviling Aimee McPherson from the pulpit, claiming that she was using her preaching to promote herself, make money and gain adulation and celebrity. Alyce also said that preachers had a certain celebrity themselves and even in small towns, expected to get a discount on groceries, see the doctor for free and other gratuities. When Alyce trained as a registered nurse, she had a component of psychiatry and noted that Aimee seemed to her to be schizophrenic, or at least in need of treatment. The ultimate conflict in the production is Aimee’s 32-day disappearance in 1926 and the resulting trial for perjury. She claimed she had been kidnapped and kept in a shack in Mexico. She had disappeared while swimming at Venice Beach and turned up later, collapsed in the Arizona desert. She had disappeared wearing a swim suit and reappeared in all her own clothes, including a corset. Since two of her acolytes had died while searching for her, the county prosecuted her for perjury, claiming she had gone for a romantic tryst with her radio engineer. 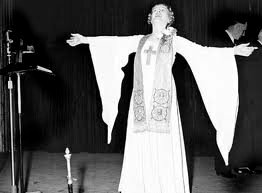 Aimee never had the same adulation from the press but she preached until her death in 1947 from a barbiturate overdose. Her son Rolf McPherson became president of the church, serving for 44 years. Saving Aimee runs at the 5th Avenue Theatre in Seattle through October 29. For single tickets (starting at $28.00) and information, please visit 5thAvenuetheatre.org or call the box office at (206) 625-1900. Tickets may also be purchased at (888) 5TH-4TIX. Saving Aimee - 5th Avenue Musical Review, Saving Aimee, Saving Aimee review, Saving Aimee seattle,Saving Aimee 5th avenue theatre seattle wa washington.